Third part of “Modern and classic sources of political theory”, article “Modern sourse” by D.Bold-Erdene, Ph.D in political science, is review of political ideologies developed and promoted by N.Macciavelli, S.Montesquieu, J.Boden, T.Gobbs, J.Lokk, J.Russo, which still has a great influence on modern democratic process-development. 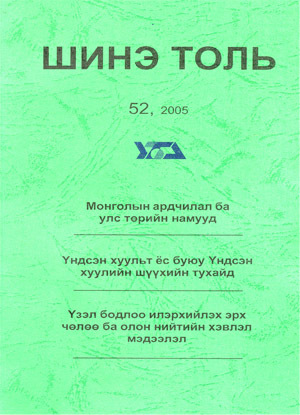 The article “Mongolian democracy and political parties”, by E.Gerelt-Od, lecturer of Mongolian Educational University, gives understanding about the connection between democracy and political parties, and introduces the prevailing and satellite parties, which were formed during the process of democratization and development of multiparty system in Mongolia. Article also focuses on specific and prevailing influence of the parties, their cooperation and competition. Ch.Onorbayar, doctorate, Mongolian State University, emphasises in his article known as “Rule of Law and Supreme Court”, on the theory of Supreme court’s control and rule of law and defines that main objective of the rule of law is to make policy more juristic in order to garantee civil rights. M.Batsuuri, lecturer at Mongolian State University, in his article Right to speech and mass media, notices that mass media is a main institute of democracy immunity, focusing on that, he explains the function of the mass media in democracy as a basic institute of the right of speech. In the article “Regional development-Decentralization”, by S.Galbadrakh, lecturer at University of Science and Technology, the author wrote the stuations, that make decentralization more complicated linking it to issues, such as poor provincial economic capasity, dependent from central budget, and mostly financed by the the central budget. Also, in seeking to solve the problem arised from decentralization he suggests a complex issues including economic, social, administrative and etc. factors.